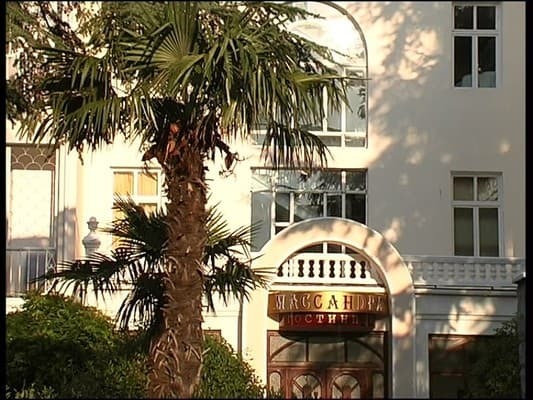 The boarding house "Massandra" is located in the eastern part of Yalta at the foot of the ancient Massandra Park 150 meters from the sea (2nd line). The hotel consists of two 4-storey buildings (buildings). 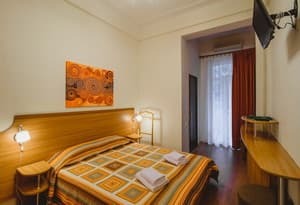 The boarding house "Massandra" offers guests 70 standard double one-room rooms on the 1st to 4th floors of the first building. Each room has a TV with satellite TV, refrigerator, air conditioning, toilet, shower, balcony. Some rooms are equipped with two single beds, some with double beds. Almost all rooms have a beautiful view of the park, the sea or the mountains. 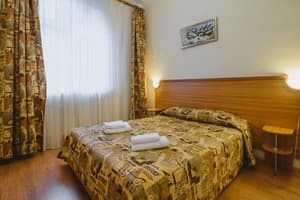 The pension has a cafe, an indoor swimming pool with a variety of hydromassage devices (operates from mid-October to mid-May), a conference room, a medical center, a sauna, a 24-hour guarded parking lot. PRICES MAY CHANGE, IT IS REQUIRED TO RECEIVE INFORMATION FROM THE OPERATOR. Description of the room: Single rooms on the 2-4 floors of the first building. On average, the standard double room is 20 square meters. m. Each room has a TV with satellite TV, refrigerator, air conditioning, toilet, shower, balcony overlooking the park and partly on the sea. Some rooms are equipped with two single beds, some with double beds. Цена! Могло бы стоить дешевле! Check arrival: from 15:00 - 16:00 hours. Check leaving: to 12:00 - 13:00 hours. Children under 3 years stay free of charge without extra beds. An extra bed is only available for children under 16 years old. The cost of extra space is 100 UAH (in the summer months and in September), at the rest of the time - 50 UAH. 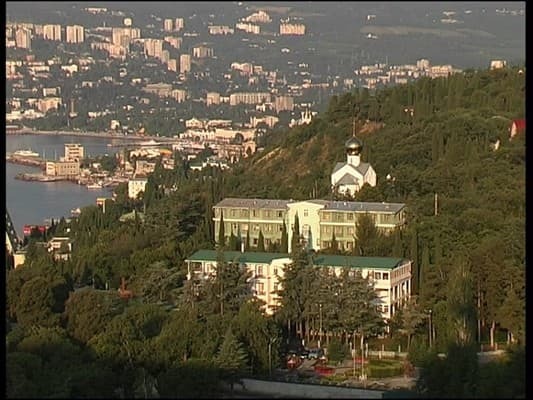 The hotel is located in the eastern part of Yalta at the foot of the ancient Massandra Park 150 meters from the sea (2nd line). Medical center: massage parlor, inhalatorium, mud cure rooms (mud applications of Lake Saki), ozonotherapy, therapeutic baths, and phytobar. By plane or train to Simferopol. From there, by bus or shuttle bus to Yalta (80-100 UAH, 1,5-2 hours) or by taxi (450-600 UAH, 1 hour 15-20 minutes). 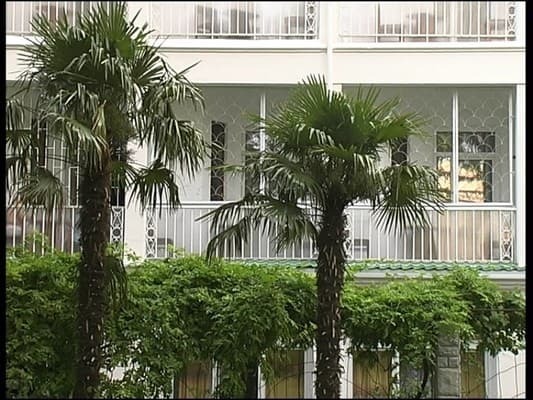 You go to the boarding house or to the hotel "Yalta-Intourist". If you are coming by car, before entering Yalta, do not miss the right ramp / turn, pass under the bridge and turn out to be to the left of the road, and then all the way down and to the right. 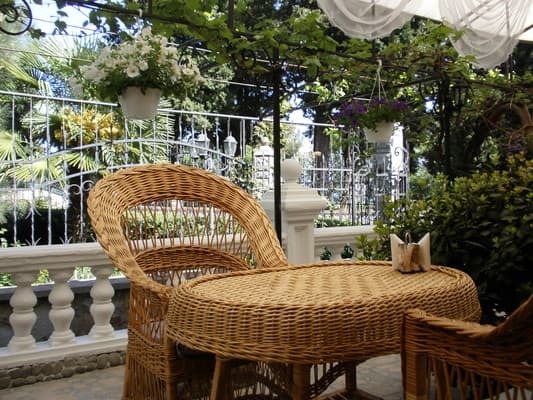 The landmarks are the Yalta-Intourist and Honeymoon hotels. Pass them and turn right to the restaurant "Avalon".